The mountain gets high-tech: from the Tyrolean style we pass directly to a kind of a space shuttle (well, almost), suspended in the air in “Star Trek” mode. The idea consists in placing a bed under the stars, in creating a room without either walls, or a ceiling, in the middle of the Dolomites at a height of 2100 meters – its name is quite simple, that is “Capsula”, and this futuristic refuge is projected by industrial designer Ross Lovegrove. “Conspicuously, it’s reminiscent of a mercury drop”, says the institutor, Moritz Craffonara – a 64-year-old manager of one of the most famous refuges in South Tyrol, “Moritzino” in La Villa. 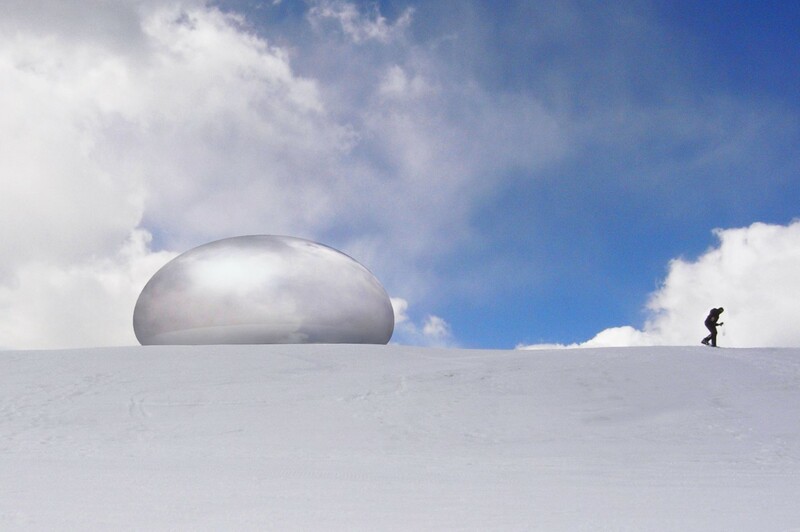 The bubble, hanging in the air (a few inches off the ground, thanks to the electromagnetic fields), will be placed on top of the famous Gran Risa slope – that one of the giant slalom of the World Cup in Alta Badia. In other words, it would be a totally new sensation for those willing to fall asleep surrounded by the glacier of Marmolada on one side, and by the range of Fanes – on the other. The feeling is that one of staying outdoors amongst the snow and under the starry sky, but, at the same time, in a perfect intimacy of an exclusive refuge. It’s an unbelievable ethereal space. Lying flat in this capsule, and maybe listening to classic music that stimulates your senses, you can enjoy the fantastic panorama of the Dolomites at 360 degrees.